• Ben's Guide to the U.S. Government for Kids: Election Process - This Library of Congress site explains how Americans pick their leaders. • CNN Student News - This site offer news for children and learning projects. 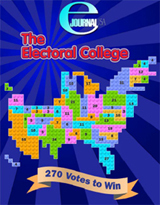 • PBS Kids The Democracy Project - This interactive Web site teaches how Americans vote. • Scholastic News: Election 2008 - This site posts news for kids, reported by kids. Each state shall appoint, in such manner as the Legislature thereof may direct, a number of electors, equal to the whole number of Senators and Representatives to which the State may be entitled in the Congress: but no Senator or Representative, or person holding an office of trust or profit under the United States, shall be appointed an elector. The electors shall meet in their respective states, and vote by ballot for two persons, of whom one at least shall not be an inhabitant of the same state with themselves. And they shall make a list of all the persons voted for, and of the number of votes for each; which list they shall sign and certify, and transmit sealed to the seat of the government of the United States, directed to the President of the Senate. The President of the Senate shall, in the presence of the Senate and House of Representatives, open all the certificates, and the votes shall then be counted. The person having the greatest number of votes shall be the President, if such number be a majority of the whole number of electors appointed; and if there be more than one who have such majority, and have an equal number of votes, then the House of Representatives shall immediately choose by ballot one of them for President; and if no person have a majority, then from the five highest on the list the said House shall in like manner choose the President. But in choosing the President, the votes shall be taken by States, the representation from each state having one vote; A quorum for this purpose shall consist of a member or members from two thirds of the states, and a majority of all the states shall be necessary to a choice.